I took my first helicopter ride with Sundance Helicopters. It was great! 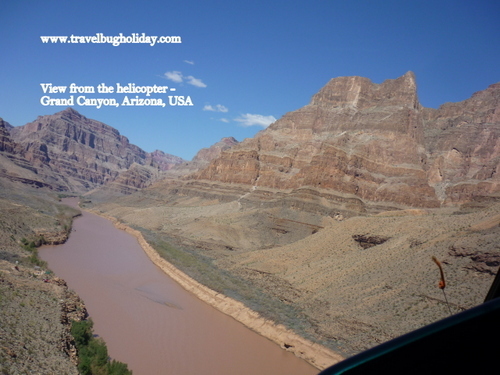 I choose flying over the Grand Canyon as my first helicopter experience. I did a lot of research on which company to use for this helicopter experience. 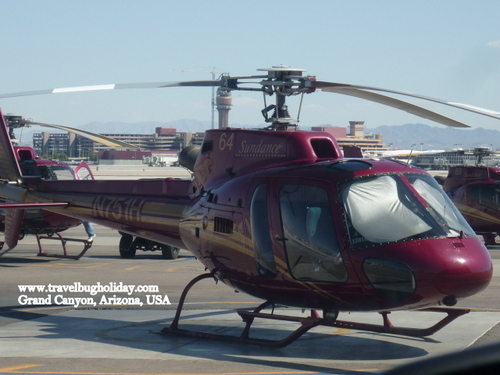 There are 2 kinds of helicopters currently on offered in Las Vegas helicopter tours. a) ECO-Star Helicopter - is 23% larger. Maverick Company and Sundance Company offer the tours using EC130. EC130 carries only 7 passengers plus the pilot. b) A-star offered by Sundance and other helicopter companies carries only 6 passengers plus the pilot. The EC130 helicopter has wider windows as compared to the rest of the helicopters offered in any flight package. Maverick Company is the only company that only uses the new ECO-Star Helicopter (EC-130). Sundance and Papillion also have the EC130 helicopters but they only have a few only. I was informed that if I choose to use Sundance or other helicopter companies for my helicopter tour, I may ride in the new EC130 helicopters or I may not as they currently have limited EC130 helicopters except for Maverick. If you are small in size, you can sit in the front of the A-star helicopter next to the pilot. However, it was explained to me that if I am of a heavier weight, it is impossible for any pilot to allocate a front seat for me (even when passengers are allocate with seats rotations), as the helicopter needs to be balance. Thus if you are bigger in size, the best helicopter for you to choose would be the EC130 as the helicopter is bigger in width and with bigger size windows, it does not matter if you are placed at the back seats of the helicopter. Viewing from an EC130 is great even from the back seat. As for viewing opportunities on the A-star helicopter, the best seats are the 2 front seats. The left seat at the back is better as that side of the helicopter had a bigger window as compared with the right side. Once you have decided on which helicopters to use, you now can decide on the type of tours to go for, as there are many options. Note that some tours offer "flights or Air Tours". You need to know these flights does not mean helicopters "flights". This most likely means using a small airplane, unless they specify, "helicopter". 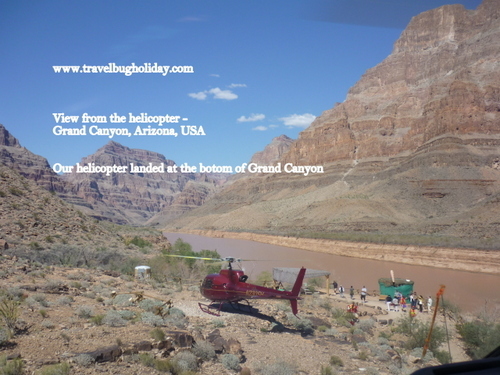 I read about the helicopter descending to the canyon floor with a boat ride. Sounds very interesting, however I felt the boat ride is anti climax ( after I have been in this boat ride). 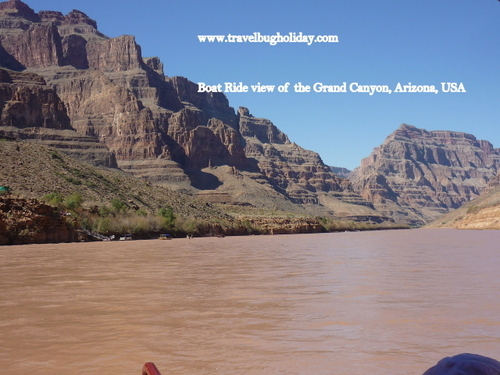 The boat ride is a mile away from the starting point and they turn back after approximately 30 minutes. 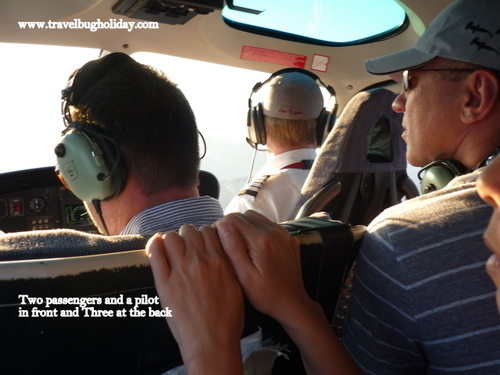 I felt that there was nothing much to see after seeing the spectacular sights from the air. Maverick does not offer a limousine pickup and only offers morning’s tours. Maverick is also slightly more expensive as it is an 8-hour tour. The best thing that Maverick has to offer is that they use the E130 helicopter with bigger windows. Sundance offers limousine pick at morning or afternoon pickup, cheaper. The biggest drawback is the older helicopter being used ( when I was booked in) and is a 5 hours tour only. I bought my ticket via this Internet website Viator. It is cheaper here as they give a discount of 10% for AAA affiliates. I find that it is cheaper to book via Viator than the best deal from the concierge at hotels, or from any special deals from the shopping centre or casino concierge. 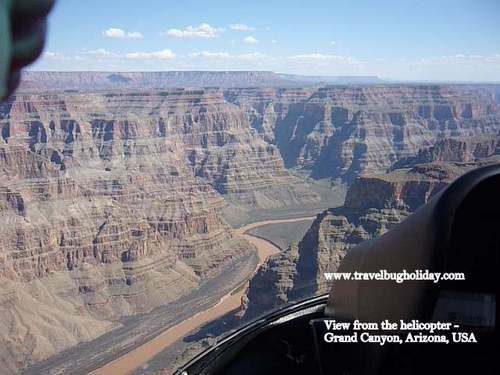 I bought my helicopter tour with Sundance for US$555 called the Ultimate Grand Canyon four in one helicopter fee excluding US$10 airport surcharge. 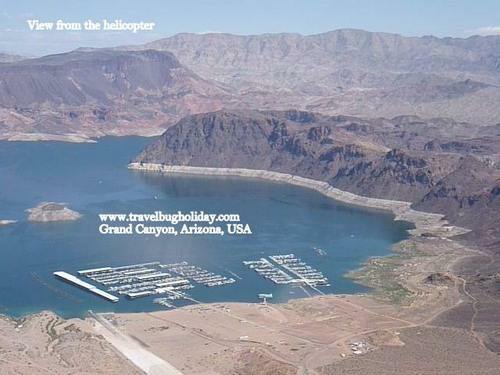 The tour comprise of a limousine pickup to and from hotel, a helicopter flight over LasVegas, over Hoover Dam, the country's largest man made lake, Lake Mead. We also had a view of Temple Rock, Iceberg Canyon and Fortification Hill, which is an extinct volcano. 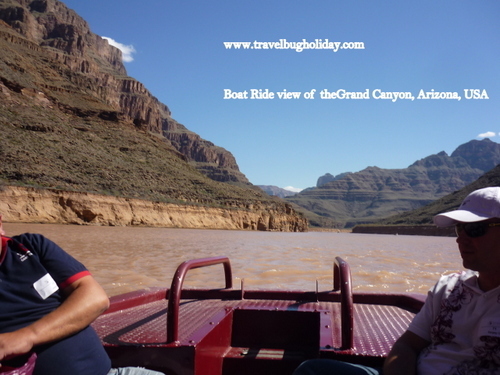 We flew through the Grand Canyon, descend and land 3,500 feet below the West rim and took a short boat ride along the Colorado River. 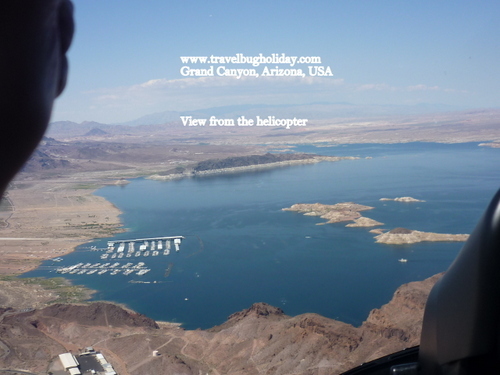 Then the helicopter picks us up again and drops us off at the Hualapai Indian Territory at Grand Canyon West. 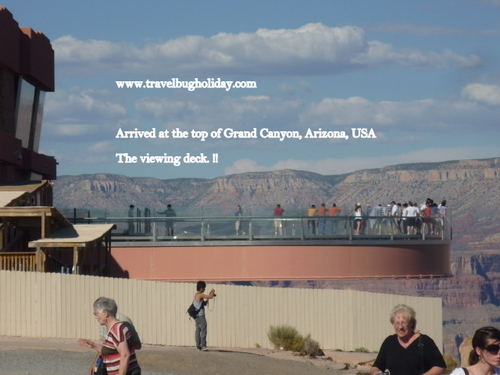 There, we had the option to do the Skywalk for US$35 (entry fee not included in helicopter tour) We visited Eagle point and the Indian Village and witness a ceremonial welcoming dance and took lots of photos of the Grand Canyon at Eagle Point. 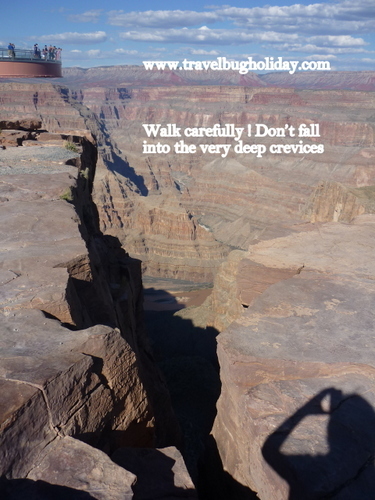 Then we took a short bus trip from Eagle Point to Guano Point for more breathtaking photos. 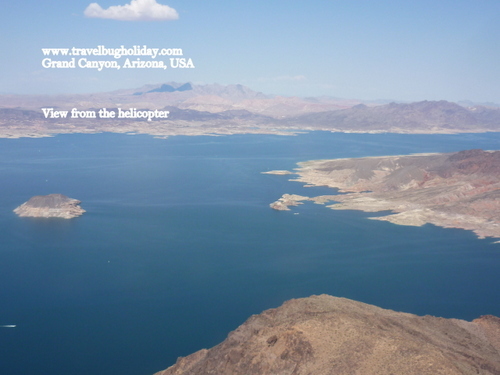 Our tour includes a lunch at Guano Point, before taking the bus back to the helicopter landing strip for our sunset flight back to Las Vegas. Note that the bus goes in one direction only. 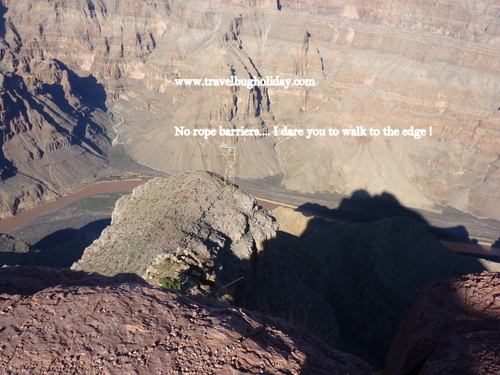 It does not take you back to the starting point eg The Skywalk etc. 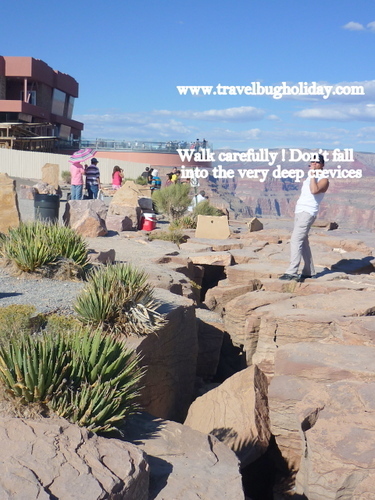 Don't make the mistake thinking that you can visit the Skywalk again after you had checked out the other parts of the Grand Canyon. A tip: If you are taking the 1pm flight with Sundance (pick up by limousine at 12 noon) make sue you have a late full breakfast as the meal voucher provided can only be redeem at Guano Point and by the time I arrived at this point, it was 4pm. 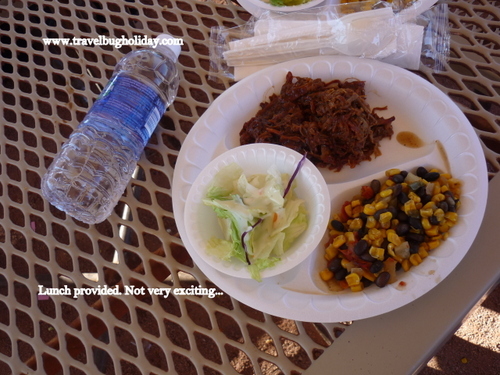 I had no choice but to buy and eat something small at the first stop at Eagle Point. 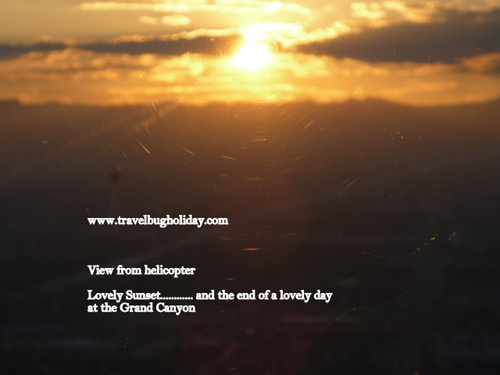 It was a great day over the Grand Canyon and one of the best view is seeing the sunset as we head home to Las Vegas.